Michael Noel and I have been planning our trip to Central Asia for years! We knew the biggest challenge would be visas. Around Christmas time and after our wild across South American to Venezuela, Colombia, Ecuador, Guyana and more, I surrendered one of my Passports to Michael for 4 months to line up the most logistically challenging trip yet requiring 5+ visas. I reached out to Linked In expert Jim Bob, chief networker to help me see if I could find any SharePoint contacts in any number of the “STANS.” Pakistan is packed with SharePoint people, but that’s a story for Michael Noel to tell, since I couldn’t get that visa in time (4-6 weeks!). I also reached out to Timus Bazicalos was already a facebook friend and we’d be talking for at least a couple of years (maybe even five years ago) about doing a SharePoint Uzbekistan event in Tashkent, the capital of Uzbekistan. We focused on Tashkent as the main hub of our trip, and as the anchor for the event. Timus would help us with logistics and ultimately be a traveling companion on our tour of the silk road and help lead us to the borders of Turkmenistan, Tajikistan, and even Afghanistan. His own visa requirements would keep him from being able to join us in those places, but it didn’t keep him from taking a week to tour the best of what Uzbekistan has to offer in some incredible ancient silk road cities of Samarkand, Bukhara, and Shakrazabh. I’ve started blogging on my travel blog about the silk road adventure trip and a few photos of the fascinating places from my trip. Tashkent is a fascinating city. As the capital of Uzbekistan with over 2 million residents, as a city it is more populated than many of the countries in Europe. It is a high tech city with great infrastructure and you can still see some signs from the former soviet republic. While my travel was focused on the 12th century and prior, our SharePoint conversations were much more focused on the future of Uzbekistan. 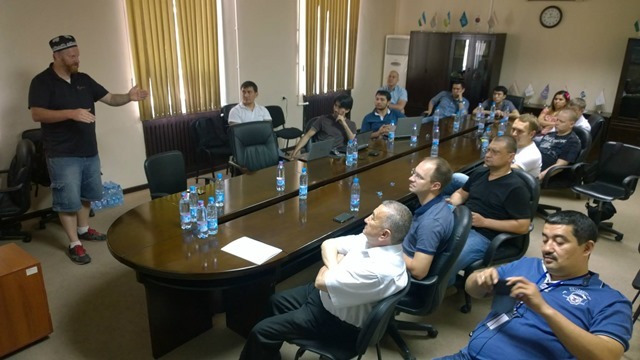 SharePoint Saturday Uzbekistan. Bottom row is Timus, Me with my Uzbek hat, and Michael Noel in the suit coat. Far right is the Microsoft rep. He’s The Microsoft country manager and only MS guy in the country. Akhadbek, is the one with the back stage pass. He has been running a SharePoint forum for Uzbeks. Minus our female SharePoint attendee. I think she snuck out when we went outside for pictures. You can see her in the picture below. Why do I bring that up? Every country I go to has a mix of males and females, and Uzbekistan as well has female IT folks. Women in IT and Women in SharePoint is important and I support their efforts. Speaking at SharePoint Saturday Uzbekistan. 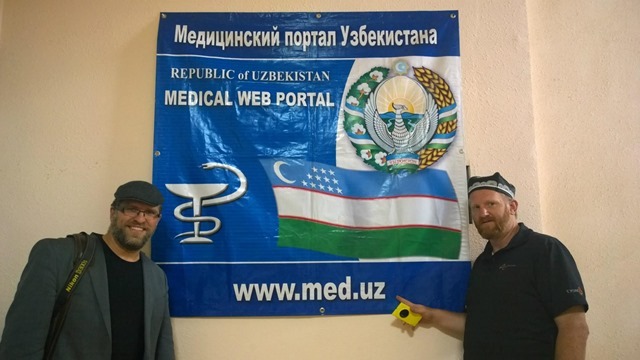 SharePoint is an important part of the strategy of the Republic of Uzbekistan for their Ministry of Health. We met with the SharePoint team at the Ministry of Health following the SharePoint Saturday after lunch. Great conversations about responsive design, and best practices discussions on infrastructure. Yeah, most of it was in Russian and Uzbek, so I didn’t understand most of it. Tina and Timus, our Uzbekistan SharePoint friend his lovely wife who were our guides who would show us the adventure of a lifetime. I feel very blessed to find amazing SharePoint people all over the planet, and have incredible experiences and adventures. Timus, thanks for being a great friend and my wish is for much success to you and your family and all of the SharePoint people we met. The world just got a little bit smaller. Next Post SharePoint Community ALS Icebucket Challenge… What’s all the Fuss about?